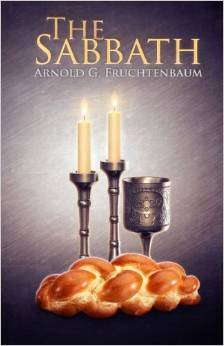 In the section entitled: “The Perpetuity of the Sabbath” of his book The Sabbath, Dr. Fruchtenbaum tries to undermine the meaning of several words in the bible that are commonly used to describe time-unending so that he can make a case for the cessation of the Sabbath ordinance. Since the bible uses words like forever, everlasting and perpetual in conjunction with the Sabbath ordinance (Exodus 31:16, Exodus 31:13, Exodus 31:17, Leviticus 24:8, 2 Chronicles 2:4), and since these words are all translated from the Hebrew word olam, Dr. Fruchtenbaum has therefore chosen to undermine the primary meaning of the word olam in order to argue that olam does not support the English meaning of the word forever. the believer’s everlasting salvation based upon the finished work of Christ. For example, if as Dr. Fruchtenbaum states, the word olam “does not carry the concept of eternity as the English word ‘forever’ does,” then this means that the word of the LORD does not stand forever (Isaiah 40:8), God will not preserve his word forever (Psalm 12:7), God’s word is not settled in heaven forever (Psalm 199:89), God’s kingdom is not an everlasting kingdom (Psalm 145:13), the LORD does not sit as a king forever (Psalm 29:10, Jeremiah 10:10) and neither is His throne forever (Psalm 45:6). The new life granted to those who believe is said to be everlasting (Daniel 12:2) and the covenant upon which this promise is based is also described as an everlasting covenant (Jeremiah 32:40) but if Dr Fruchtenbaum is right, then these verses must consequently be understood differently. Also, by using the word olam, the bible is able to state that YHWH (i.e. Yahweh) is the everlasting God (Genesis 21:33, Isaiah 40:28, Psalm 90:2), that He has everlasting strength (Isaiah 26:4), that Jesus the Messiah is from everlasting (Micah 5:2) and that God is eternal (Deuteronomy 33:27) but now these verses and their meanings have all been drawn into question merely because Dr. Fruchtenbaum wants to convince his audience that when God tells the Israelites that they are to keep the Sabbath perpetually, He did not literally mean for them to keep it throughout their generations. In a way, combating Fruchtenbaum’s logic in this section is futile if the goal is merely to show that the Church (i.e. the universal congregation of the righteous) should observe the Sabbath ordinance as defined in Genesis 2:3. It’s futile because the bible already reveals that the Sabbath will be kept prior to Christ’s return (Matthew 24:20), during the millennial reign of Christ (Ezekiel 44:24, Ezekiel 46:1) and throughout the eternity of the new heavens and the new earth (Isaiah 66:22-23). This stunning confirmation of the Sabbath’s perpetuity should convince even the staunchest anti-sabbatarian that God does not speak haphazardly when He claims that the Sabbath statute is forever. What this means is that even if Fruchtenbaum were right about the word olam not really meaning forever (or perpetual), one could still confidently assert that the Sabbath will persist eternally based upon the verses that were just provided. Nevertheless, Hebrew lexicons, Scripture, and plain reason all betray Dr. Fruchtenbaum’s bewildering attempt to undermine the definitions of words whose true meaning have been established by their multiple occurrences in the bible. Secondly, in order to accomplish his goal, Dr. Fruchtenbaum has to redefine olam’s scope to include things that olam could not possibly anticipate, such as the days of a man’s life or the days of an age. In doing so he may find some support among certain commentaries that suggest olam has come to be used (especially by post biblical writers) to refer to an age or period. [TWOT] The problem with this notion however is that the idea of an eternal age or an everlasting duration seems oxymoronic. Lastly, Dr. Fruchtenbaum seems to conflate the meaning of the single word olam with the meaning of the whole sentence which contains the word olam. It is for these reasons that I have undertaken this task of critiquing Dr. Fruchtenbaum’s position on the perpetuity of the Sabbath. All the verses cited in this essay (unless otherwise noted) are from the King James Version of the bible. There are circles, among both Jewish believers and Gentile believers, who feel that the Sabbath is perpetual and therefore must be observed to this day. Some would insist that the Sabbath must be observed from sundown Friday to sundown Saturday and others observe the Sabbath on Sunday , but both groups claim that the Sabbath is still mandatory. This section will be covered in two parts: first, the basis and secondly, the application and conclusion. There are is [sic] three key phrases found in conjunction with the Sabbath that are used as the basis for teaching that the Sabbath is perpetual. The first key phrase is throughout your generations (Ex. 31: 13). The second key phrase is the term perpetual (Ex. 31: 16), which is taken to mean “unending.” The third key phrase is the term for ever (Ex. 31: 17), which is taken to mean “eternal,” and therefore, still mandatory today. Incidentally, the KJV also uses the term “everlasting” in conjunction with the Sabbath albeit by implication in Leviticus 24:8. Also, Dr. Fruchtenbaum fails to include or reference other phrases in verses like Isaiah 66:23-23, Isaiah 56:6-7, Ezekiel 44:22 or Ezekiel 46:1 that also teach the perpetuity of the Sabbath. For instance, Isaiah 66:22-23 uses the phrase “the new heavens and the new earth…shall remain before me” in conjunction with “from one Sabbath to another.” According to the Keil & Delitzsch Commentary on the Old Testament, Isaiah 66:23 means that in the future, the Sabbath “will still be celebrated.”  Also, the Old Testament Commentary by Robert Jamieson, A. R. Fausset and David Brown adds that Isaiah 66:23 means the Sabbath “is therefore perpetually obligatory on earth.” Dr. John P. Lange, in his commentary sees these Sabbaths yet to come as being “celebrated by all flesh in the old Jewish fashion.” The point is, the assertions made by these theologians agree with the idea that Isaiah 66:23 is “referring [to] the new heavens and earth when mankind will enter eternity” and “gather each Sabbath day around the throne and worship before the Lord.”  Therefore, the “everlastingness” of Isaiah 66:22’s “new heavens and the new earth” is just as pertinent as the three key phrases mentioned by Dr. Fruchtenbaum. The first key phrase is throughout your generations. The Hebrew word for this term is ledorot. While it is used of the Sabbath, this expression is also used of a man’s lifetime (Lev. 25: 30), of the Levitical Priesthood (Ex. 40: 15; Lev. 6: 22; 10: 9; Num . 10: 8; 18: 23), of the ceremony of the lampstands (Ex. 27: 21; Lev. 24: 3), of the service of the brazen laver (Ex. 30: 21), of the meal-offering (Lev. 6: 18), and of the sacrificial system (Lev. 7: 36; Num. 15: 15). The second key phrase used as a basis for teaching the perpetuity of the Sabbath is the term perpetual. The Hebrew word is either tamid, which means “perpetual” or chok olam, which means “a perpetual statute.” This is not only used of the Sabbath , it is also used of the ceremony of the shewbread (Lev. 24: 9), which everybody agrees has ended with Messiah’s death. As Leviticus 24:8-9 calls the ceremony of the shewbread “an everlasting covenant” and a “perpetual statute” one might ask: in what sense was the shewbread observance a perpetual covenant on behalf of the children of Israel? After all, Dr. Fruchtenbaum states that the ceremony of the shewbread ended with Messiah’s death and that everyone agrees with this idea. Fortunately, in Jeremiah 50:5, the bible refers to the phrase “perpetual covenant” as a covenant “that shall not be forgotten.” We therefore have no need of searching for another understanding as it pertains to this phrase since this appears to be the same sense in which Leviticus 24:9 uses it. The problem with Fruchtenbaum’s point is that he doesn’t tell us what aspect of Christ’s death caused the ceremony of the shewbread to cease, he just states it as a matter of fact. The bible doesn’t say that Christ died and therefore the ceremony of the shewbread has ended. In fact, how Fruchtenbaum can be so certain that future temples spoken of in the Scriptures such as the “Great Tribulation” Temple (Daniel 8:13, Matthew 24:15, 2 Thessalonians 2:4, Revelation 11:2) or Ezekiel’s Millennial Temple (Ezekiel 41-42) will not incorporate this ceremony eludes me. After all, Ezekiel tells us that the future Millennial Temple will have a sanctuary where holy food is kept, just like the tabernacle, the First (Solomon’s Temple) and the Second (Zerubabel’s Temple) Temples all had a sanctuary for the shewbread (Ezekiel 42:13). Also mentioned by Ezekiel (in chapter 41 verse 22) is an alter-table that is contextually consistent with that used for the shewbread in the past temples. So contextually consistent it is, that the Cambridge Bible Commentary on Ezekiel 41:22 affirms the probability “that [Ezekiel] refers here to the altar-like table of shewbread.”[Cambridge Ez 41:22] Dr. Thomas L. Constable and Dr. John Gill, in their expositions of the same verse also see as plausible the idea that the table of shewbread is in view with the latter suggesting the prospect that the “divine guide of the prophet [Ezekiel]… pointed to the table of shewbread” when he proclaimed: “This is the table that is before the LORD.” Meanwhile, Paul Butler’s commentary on Ezekiel 41:22 in the College Press Bible Study Textbook discusses the possibility that in this verse “the table of showbread is being described metaphorically as an altar.”[College Press Eze 41:22] In the Expositor’s Bible Commentary, Prof. John Skinner appears the most certain when he states that “the only piece of furniture mentioned in the [Millennial] Temple is an altar or table in the hall, immediately in front of the Most Holy Place (Ezekiel 41:22)” and that the “reference is no doubt to the table on which the shewbread was laid out before Jehovah. (cf. Exodus 25:23-30).” [-EBC (Eze 42:13)] Lastly, according to Dr. John P. Lange’s commentary on the same verse, some theologians think that “the altar-table [of Ezekiel’s Millennial Temple] was meant to combine in one the old table of shew-bread and the altar of incense” [-Lange (Eze 41:22)]. With all of these references by theologians to the table of shewbread and its re-emergence in the Millennial temple, perhaps it is a bit premature to conclude that everyone agrees that the ceremony of the shewbread ended with Messiah’s death. The point is that since the Millennial Temple will accommodate animal sacrifices (Ezekiel 43:18-27, Ezekiel 45:15,17) despite Messiah’s death, then unless otherwise stated, there is no good reason why it couldn’t also include the ceremony of the shewbread. In light of Ezekiel’s visions of the Millennial temple, the scriptures alone do not state or support the idea that this ceremony has ended for good. The third key phrase is for ever. The simple, basic truth is that Classical Hebrew— the Hebrew of the Old Testament Scriptures— has no term that carries the concept of “eternity.” There are phrases that carry this concept, such as “without end,” but there is not a single word that carries the concept of eternity as there is in English. To focus on the meaning of the term for ever, six things should be kept in mind. I must interrupt Dr. Fruchtenbaum at this point to inform the reader that Richard Watson’s Biblical and Theological Dictionary tells us “[t]he Hebrew word for eternity is [olam]” and that “[t]his is its proper sense.”[Watson on Eternity] So, not only does the word olam carry the concept of eternity unlike what Dr. Fruchtenbaum has stated (and as Isaiah 40:8 demands that we admit) but there are also other “Classical Hebrew” terms that do so as well. For instance, in Isaiah 57:15 when the bible states that God “inhabits eternity” it does so by translating the Hebrew word ad as eternity; the same word is also translated as everlasting in Isaiah 26:4. Furthermore, the Hebrew word netsach is translated as forever in Psalms 68:16 which speaks of how long God intends on dwelling in Mount Zion; it is also translated as evermore in Psalm 16:11 where we read that at God’s right hand are pleasures for that long. The concept of eternity is firmly conveyed in these and other classical Hebrew terms so this line of argument by Dr. Fruchtenbaum is without merit. First, the Hebrew word is olam. The word itself simply means “long duration,” “antiquity,”“futurity,”“until the end of a period of time.” That period of time is determined by the context. Sometimes it is the length of a man’s life, sometimes it is an age, and sometimes it is a dispensation. And sometimes olam means everlasting—in fact, it almost always does. If we allow Dr. Fruchtenbaum’s commentary on the word olam to stand then we must conclude that many respected Hebrew Lexicons such as Brown-Driver-Briggs, Genesius or Strongs are all incorrect since these lexicon’s list “eternity” among the semantic range of the Hebrew word olam. Furthermore, and as stated earlier, hundreds of verses must now be called into question since for example, the KJV which includes over 438 citations of the word olam, translates it as “for ever” 269 times, as “everlasting” more than 64 times, as “perpetual” 22 times, as “never” 16 times and as “evermore” at least 15 times. In fact, over 90 percent of the time when it is used in the Scriptures, the word olam is translated to an English word or phrase that literally means “time unending.” Admittedly, olam is also used figuratively several times in the Scriptures. Perhaps, Dr. Fruchtenbaum is confusing olam’s figurative usage with what the word literally and thus actually means. Dr. Fruchtenbaum appears to tell us here that the word olam has been grossly mistranslated in the English versions of our bibles. After all, “for ever” is the most prevalent English phrase used when translating the Hebrew word olam in the English bible. As mentioned earlier, his commentary calls into question the aptitude of the men who penned these Hebrew lexicons that we rely on since apparently they have all misapprehended the true meaning of the word olam. Or again, perhaps Dr. Fruchtenbaum is confusing the meaning of the word olam with the meaning of the sentence that contains the word olam. Other words that appear in the same sentence as olam can limit the effect that olam has on the entire sentence but the sentence itself cannot confer a new meaning upon olam such that it must now increment or expand its semantic boundaries as a consequence. This means that any figurative usage of the word olam should be distinguished from its actual meaning for the sake of clarity. The third thing to keep in mind is that the word olam, le-olam, or ad-olam, sometimes means only up “to the end of a man’s life.” For example, it is used of someone’s lifetime (Ex. 14: 13), of a slave’s life (Ex. 21: 6; Lev. 25: 46; Deut. 15: 17), of Samuel’s life (I Sam. 1: 22; 2: 35), of the lifetimes of David and Jonathan (I Sam. 20: 23), and of David’s lifetime (I Sam. 27: 12; 28: 2; I Chr. 28 :4). While the English reads for ever, obviously from the context it does not mean “forever” in the sense of eternity, but only up to the end of the person’s life. Just because olam literally means forever doesn’t preclude the olam-containing-sentence from using the word in a non-literal fashion. In all the verses cited above, the bible uses olam figuratively. That this is the case is easily understood from the context of each verse listed. The specific figure of speech employed in these verses is called an hyperbole. However, it is important to keep in mind that the figurative use of a word must rely upon the normal meaning of the word so that the figure of speech can convey its effect. As such is the case, if the word olam didn’t literally mean forever then all attempts to use the word figuratively become unintelligible. We too at times use the word forever figuratively. One might say: the train took forever to arrive this morning; however, it is understood that what was really meant is that the train took longer than expected to arrive. A proposition, being the meaning of a declarative sentence (and not words in the sentence itself), does not always project the literal meaning of each word in the declarative sentence especially when the sentence employs literary devices. So we see that the proposition conveyed by a sentence may be figurative even though the words that comprise the sentence are not. In fact, Metaphors are quintessential of such a scenario. For example, when Proverbs 18:10 tells us that the “name of the LORD is a strong tower” we see that each individual word must be taken in its normal sense and yet the entire sentence must mean something different than what the sentence conveys literally. (31) Then Bathsheba bowed with her face to the earth, and did reverence to the king, and said, Let my lord king David live [to the end of a man’s life]. Let it then be clearly understood that if the word olam did not literally mean forever as Dr. Fruchtenbaum argues, then all the verses in the bible which rely on this particular meaning in order to use olam figuratively suddenly become incomprehensible. Another point to keep in mind is that the word olam could not literally mean “to the end of a man’s life” for if it did, the mere mention of the word olam would conjure this meaning (among other legitimate ones) in the mind of the hearer without the need for olam to be used in a sentence. Also, one would expect to find this meaning documented in many if not most of the ancient Hebrew lexicons. Alas, neither expectation is met. Furthermore, in many of the verses that Dr. Fruchtenbaum lists, the biblical author uses olam to describe the intended longevity of a verb and not the longevity of the verb’s subject; therefore, olam could never mean “to the end of a man’s life.” For example, Exodus 14:13 states “ye shall SEE them no more forever,” Exodus 21:6 mentions “he shall SERVE him forever,” while Leviticus 25:46 proclaims “they shall BE YOUR BONDMEN for ever.” Again, notice that olam as used in these verses, doesn’t presume to predict the longevity of the verb’s subject. The fourth thing to keep in mind about the meaning of olam is that it sometimes means only “an age” or “dispensation.” For example, Deuteronomy 23:3 uses the term for ever but limits the term to only ten generations. Here it obviously carries the concept of an age. In II Chronicles 7: 16, it is used only for the period of the First Temple. As for its usage in II Chronicles 7:16, contrary to Dr. Fruchtenbaum’s assertion, olam only serves to describe the intended longevity of God’s presence, not the duration of the temple’ structure. Secondly, though II Chronicles 7:16 is not a law like Deuteronomy 23:3, the Romans 7:1 principle regarding the contingency of a statute’s dominion is still relevant. Meaning, God’s intent is contingent upon the availability of the temple. Specifically, II Chronicles 7:16 tells us that God’s desire is for His presence (i.e. His name, eyes and heart) in the temple to never end (i.e. to be there forever or perpetually) so long as the temple exists. The phrase “so long as the temple exists”, though implied, does not explicitly appear in the text. Yet, this addition is indispensable since God’s intention (i.e. that His presence should inhabit the temple) assumes or takes for granted the existence of a temple in which His presence can abide. If this assumed proposition were actually included in the text, it would state: “All desires by God for His presence to inhabit the temple are desires that require the temple to exist.” Of course, if the temple no longer exists then God’s desire to be there forever cannot be realized, but this is ok. There is no problem with the intended duration of God’s presence being limited by a contingency such as the temple’s longevity. There is however a problem when the intended duration of God’s presence is unnecessarily redefined to accommodate an arbitrary time span such as “the period of the First Temple.” Again, the clear distinction between the duration of the verb (i.e. how long God wants to be there) and the duration of the noun (i.e. the temple’s longevity) cannot be overstated. So we see that one does not need to mess with or change the meaning of the word olam in order to comprehend II Chronicles 7:16. The take home point is that, if olam sometimes meant “an age” or “dispensation” then these definitions would also be listed along with the olam’s primary definition in most ancient Hebrew lexicons. Of course, if any sentence could arbitrarily supplement the established semantic scope of a given word—and do so in a non-stipulative sense—then dictionaries would serve no purpose. There is simply no way of getting around the fact that the word olam in these verses actually means forever. So, again, the word for ever in Hebrew does not mean “eternal” as it does in English; it means up to the end of a period of time, either a man’s life, or an age, or a dispensation. Baker’s Evangelical Dictionary of Theology agrees that olam corresponds to eternity and also reminds us that in the Psalms alone the term forever “is used to describe God’s reign (9:7), his protection (12:7), his plans (33:11), the inheritance of his people (37:18), his throne (55:19), his rule (66:7), his remembrance of his covenant (105:8), his righteousness (111:3), his faithfulness (117:2), his statutes (119:111, 152), and his name (135:13).” [BED on Eternity] Employing Dr. Fruchtenbaum’s reasoning would force us to conclude that these verses by the Psalmist are all referring to something other than the idea of eternity; a conclusion that I dare say even Fruchtenbaum would find unthinkable. The Brown-Driver-Briggs, Genesius and Strong’s Hebrew lexicons all have the word “eternity” prominently included in their definitions of olam. Other citations beyond these ten could be furnished were it deemed necessary. The fifth thing to keep in mind is that the same word for “forever” is used of certain ceremonial facets of the Mosaic Law that everyone agrees have ended with the First Coming of the Messiah. For example, the same word for ever is used of the kindling of the Tabernacle lampstands (Ex. 27: 20; Lev. 24: 3), of the ceremony of the shewbread (Lev. 24: 8), of the service of the brazen laver (Ex. 30: 21), of the Levitical Priesthood and Levitical garments (Ex. 28: 43; 40: 15; Lev. 6: 18; 10: 9; Num. 10: 8; 18: 23; 25: 13; Deut. 18: 5; I Chr. 15: 2; 23: 13), of the sacrificial system, including the sacrifices and offerings (Ex . 29: 28; Lev. 7: 34, 36; 10: 15; Num. 15: 15; 18: 8, 11, 19; 19: 10), of the Day of Atonement sacrifice (Lev. 16: 34), and of the red heifer offering (Num. 19: 10). Where in Scripture is it stated that these ceremonial facets of the Mosaic Law have ended? Perhaps Dr. Fruchtenbaum is referring to Hebrews; let’s look there since it contains some of the usual suspects. When the writer of Hebrews 7:18 says: “there is verily a disannulling of the [prior] commandment … for the weakness and unprofitableness thereof,” what commandment is he referring to? Could he be referring to the ceremonial facets of the Mosaic Law? In Romans 7:12, Paul says that “the law is holy, and the commandment holy, and just, and good” so we know that the Law described in Romans 7:12 is not what is in scope. Actually, the answer is found two verses earlier in Hebrews 7:16 where we find the discussion of “a carnal commandment” that “maketh men high priests which have infirmity.” This rules out Hebrews 7:18 as a verse which could corroborate the claim that the ceremonial facets of the Mosaic Law have ended. Speaking of the fragile and conditional nature of the Old Covenant (which was initiated in Exodus 19:5-8), Hebrews 8:13 says: “that [covenant] which decayeth and waxeth old is ready to vanish away.” But the ceremonial facets of the Mosaic Law are not coextensive with the Old Covenant so this verse doesn’t corroborate Fruchtenbaum’s claim either. Incidentally, the new covenant comes with laws just like the old covenant, for in speaking of the new covenant God says “I will put my law into their mind and write it in their hearts.” (Jeremiah 31:33, Hebrews 8:10) Obviously, keeping the Law does not result in a righteousness that is salvific, nevertheless it is instructive that in the new covenant all the laws do not simply vanish away. In fact, all ten commandments and many more mitzvahs are re-emphasized in the New Covenant writings of the New Testament. Hebrews 10:9 tells us that (as it pertains to achieving perfection—c.f. Heb 10:1) God takes away the first [method] so that He may establish the second; but the ceremonial facets of the Law (as they pertain to removing ceremonial uncleanness) are not in view here either since they were never efficacious for salvation to begin with (Galatians 3:21, Hebrews 10:4). Romans 10:4 tells us that Christ is the end of the law for righteousness, therefore some theologians have taken the Greek word “telos” (which is translated as end) to mean that Christ is the termination of the law. It is however a highly unlikely interpretation given that Christ promised that He had not come to abolish the law (Matthew 5:17) and also because Paul reveals in Romans 3:31 that faith in Christ actually establishes the Law. Besides, telos can also mean “goal” which is another synonym for “end” and which agrees with the second part of Matthew 5:17. But even if we were to allow Romans 10:4 to say that Christ is the termination of the Law for righteousness, it still doesn’t say anything about Christ being the end of the law for the ceremonial purifying of the flesh (Heb 9:13). The Law has many purposes or goals and ceremonial purification is just one of them. Ironically, the furnishing of a salvific righteousness based upon dutiful law-keeping is never mentioned in scripture as a purpose for the establishment of the Law. Nevertheless, just because one purpose of the law is allegedly terminated, that doesn’t mean that all other purposes of the law are also terminated. We mustn’t forget that in the coming Millennial kingdom, the presence of God will once again dwell on earth amongst both clean and unclean people. The outward cleansing achieved by the ceremonial facets of the Mosaic Law will be indispensable for those without glorified bodies. Getting back to our original inquiry, how did Dr. Fruchtenbaum reach the conclusion that the ceremonial facets of the Mosaic Law have ended? We have gone through the all usual suspects but to no avail. We could conclude from Fruchtenbaum’s failure to cite Scripture that his referent is merely popular theology; after all, he says “that everyone agrees.” Still, Fruchtenbaum’s appeal to the unrealistic consensus of “everyone” makes me wonder if this same rationale is behind his determinations about which of the facets have ended and which ones haven’t. For instance, have the ten commandments ended as well? After all, aren’t they also a facet of the Mosaic Law? If only we knew Fruchtenbaum’s reasoning behind which laws still apply and which laws have ended, we could then apply it to other use-cases such as the ten commandments; at least for the sake of consistency. Alas, there is no method revealed for how he has made these determinations besides his appeal to an indefensible majority of everyone. Besides, if all of these ceremonial facets ended with the first coming of the Messiah as Fruchtenbaum claims, then how come they explicitly reappear in Ezekiel’s Millennial temple that is yet to come? The sacrificial system including the sacrifices (Ezekiel 40:42, Ezekiel 44:11, Ezekiel 46:24), Burnt offerings (Ezekiel 46:13), Meat (Meal) offerings (Ezekiel 46:15), Trespass offerings (Ezekiel 40:39), Sin offerings (Ezekiel 40:39), Drink offerings (Ezekiel 45:17), Peace offerings (Ezekiel 45:17) and the Levitical Priesthood & garments (Ezekiel 40:46, 43:19, 44:15, 48:11) all continue in Ezekiel’s depiction of the Millennial Temple and on a daily basis. Feast days of the Mosaic Law also continue during the Millennial period as well. For instance, the Feast of Tabernacles (Ezekiel 45:25), New Moon Offerings (Ezekiel 46:6-7), and Sabbath Offerings (Ezekiel 46:4-5) all persist throughout the Millennial kingdom. So we clearly see that Ezekiel does not agree that these “ceremonial facets” of the Mosaic Law have ended. Furthermore, the Sabbath is not a ceremonial facet of the Mosaic Law so the things that supposedly apply to those facets of the Mosaic Law do not necessarily apply to the Sabbath. Notwithstanding, even if the Sabbath were a ceremonial facet, Ezekiel explicitly asserts that the Sabbath will be kept during the Millennial Temple’s period (Ezekiel 46:1-4) so it is impossible for Christ’s death to have ended something that according to Scripture is yet to occur. The Sabbath is a moral facet of the Mosaic Law, and as such, it reflects God’s unchanging standard for man as it pertains to rest. It is God’s desire that all men (Mark 2:27) rest on the seventh day of each week not just now, but also in the eternity of the new heavens and the new earth. To this end, God has promised that all flesh will adhere to that eternal decree (Isaiah 66:22-23). All laws regarding the shewbread are laws that will never end (i.e. are forever) as long as the temple/tabernacle exists. All laws regarding the showbread are laws that require the tabernacle or temple to exist. Seen in this way, any statute that is modified by the word olam and is contingent upon the longevity of a temporary entity should be regarded as if it were an enthymeme. In logic, enthymemes are arguments in which one or more of the required premises are taken for granted and therefore omitted. According to the Christian philosopher Dr. Gordon Clark, most statements in ordinary conversation are enthymemes. [Clark’s Logic book] Sometimes, if the premise that’s being taken for granted isn’t obvious, the reader could misapprehend a verse as merely an isolated proposition when it’s really an enthymeme. Since the entire bible is ultimately written by the same author, an enthymeme in one book of the bible may have its assumed premise(s) scattered throughout other books of the bible, thereby causing many readers to have perhaps entertained enthymemes unawares. Such is the case with a verse like 1 Timothy 6:10 which many have consequently misunderstood. Verses 9 and 11 of 1 Timothy 6 demonstrate that the phrase “the love of money” in verse 10 is not merely about wanting to have riches, rather, it is wanting riches at the expense of not loving God the most. Therefore it is “the love of money” over the love of God that makes 1 Timothy 6:10 qualify as a violation of the first commandment in the Decalogue; a commandment which incidentally is described by God as the root and greatest of all other commandments (Matthew 22:36-38). Were one to incorporate its contextual verses, 1 Timothy 6:10 as an unabridged proposition would instead read: the love of money over the love of God is the root of all evil. This makes sense since to violate what is the root of all good (i.e. the first commandment) is conversely to engage in what is the root of all evil. 1.The love of anything over the love of God is the root of all evil. 2.Money is an example of anything. 3. (Therefore) The love of money over the love of God is the root of all evil. So we see that the apparent difficulty in 1 Timothy 6:10 is alleviated once we allow that the Writer employed an enthymeme. Specifically, He assumed the truth of Matthew 22:36-38 and its corollary which states: the love of anything over the love of God is the root of all evil. The point of all that has been said is that the Writer’s implicitly expressed assumptions can limit the overall meaning of the text. So, when the tabernacle-oriented laws in the verses that were cited by Fruchtenbaum contain the word olam we must ensure that we’ve taken into account any assumptions that are implicit in those verses, that way we grasp the full meaning of the proposition. With the above principles in mind (especially the Romans 7:1 rule), one can see how a perpetual statute’s dominion over a man is always conditional since it is predicated upon the preconditions necessary for the law to thrive. For example, all perpetual laws, including the Sabbath ordinance, presuppose that the law-keeper is alive in order to observe these laws, therefore the availability of the law-keeper is a precondition that needs to be met for the law to thrive. If the law-keeper is dead then the law, though perpetual, is powerless over that person since he or she no longer lives. Additionally, for temple-oriented laws, another precondition is that the temple spoken of is actually in place. After all, without a temple or a tabernacle how can one perform the various offerings that are prescribed in the verses cited by Dr. Fruchtenbaum? Therefore, when the entities required to make a law meaningful are no longer available, it makes sense that the perpetual law which was binding on those entities would no longer have dominion despite the fact that the law itself lives on (Matt 5:18, Luke 16:17, Rom 7:1). In this way, the word olam still makes the statute perpetual without impacting the statute’s dominion over its subjects; which again, is contingent upon the longevity or availability of the subject. In summary, statutes that contain the word olam are either statutes that will never be forgotten (Jeremiah 50:5), statues that are conditionally perpetual (i.e. as long as the tabernacle or temple exists) or statues that are unconditionally perpetual (i.e. the sabbath). And sixth thing to keep in mind is the application: if Sabbath-keeping were mandatory based upon the Hebrew term for ever, then so are all the other facets of the Law of Moses. Yet even Sabbath-keepers claim that these other things have been brought to an end by the Messiah. Therefore, it is inconsistent for them to say that all the others ended, but the Sabbath has not. The question again is, how can one say that these “other facets” of the Mosaic Law have been brought to an end when Ezekiel says that not only will they reappear, but will also be efficacious for removing ceremonial uncleanness in the Millennial temple that is yet to come? (Ezekiel 16:63, 43:20, 43:26, 45:15, 45:17, 45:20). In fact, Ezekiel is not alone, at least five other prophets also testify to the future continuance of the sacrificial system (Isaiah 56:7, Isaiah 66:20-21, Jeremiah 33:18, Daniel 12:11?, Zechariah 14:16-21, Malachi 3:3-4). One might then ask why the sacrificial system (at least as of the 21st century) is not currently in usage if it is in fact perpetual. However, we must remember that both prophets Hosea and Daniel prophesied about the current hiatus of the sacrificial system (Hosea 3:4, Daniel 8:11-13, Daniel 9:27) and even of a future hiatus (Daniel 12:11) that is yet to come. Their prophecies make the current suspension of the sacrificial statutes comport with the Scriptures having priorly been ordained by them. Therefore, if God says in His Word that certain facets of the Mosaic Law are perpetual then that is what they are. Besides, we have already discussed how the reader should understand these perpetual laws in light of other biblical principles. For example, when there is no more temple (Revelation 21:22) then all perpetual ordinances (i.e. the sacrificial system including it’s details such as the ceremony of the shewbread, the brazen laver and the different type of offerings) that are contingent upon the existence of a temple will no longer have dominion over those to whom the ordinances applied. Incidentally, there is retributive irony in Dr. Fruchtenbaum’s constant appeals to the supposed cessation of certain perpetual statues in the Mosaic Law. This is because his argument also requires the dismissal of the Decalogue when drawn to it’s logical conclusion. For consistency sake, if the Sabbath too has ended due to the Messiah’s death then Fruchtenbaum’s hermeneutic would require that the other nine commandments suffer the same fate as well. After all, why would the other nine commandments still apply if the Sabbath isn’t binding any longer? What makes the third commandment any more indispensable than the fourth? Aren’t all ten commandments predicated upon the same basis (Exodus 20:2)? Aren’t the other commandments also facets of the Mosaic Law? So for the sake of consistency, Dr. Fruchtenbaum should espouse the idea that the duty to love and serve only the biblical God—which is the First Commandment—has come to an end with Messiah’s death. I, on the other hand, do not claim that the facets cited by Dr. Fruchtenbaum (i.e. the sacrificial system, etc.) have ended since the scriptures say they are perpetual and since these facets reappear in the Millennial Kingdom. However, even if one were to say that all these facets have ended except for the Sabbath which remains perpetual, there are enough differences between the Sabbath and these other facets so that the claim is at least defensible. For instance, the Sabbath’s observance is not contingent upon the existence of a physical temple like the “other facets” of the Mosaic Law. In the eternity of the new heaven and earth there is no temple (Rev 21:22) so we would expect the perpetual laws of the sacrificial system to have no dominion over mankind. Secondly, we know that God still intends for mankind to keep the Sabbath because He promises future merit for those who continue to keep His Sabbaths holy (Isaiah 56:2-7). When you combine this with the fact that the Sabbath’s observance is required in eternity (Isaiah 66:22-23), you have an insurmountable argument for the perpetuity of the Sabbath. If terms such as for ever, perpetual statute, and throughout your generations mean that the Sabbath is still mandatory, then so are all those other facets of the Law of Moses mandatory as well. Yet even Sabbath-keepers rule out the others but do not rule out the Sabbath, although the same words are used. Thus, they lose their main foundation for arguing of the perpetuity of the Sabbath day. It is inconsistent exegesis to insist on the basis of such terms as for ever, throughout your generations, and perpetual statute that the Sabbath law is still mandatory, without incorporating all of those other elements from the Law of Moses for the same reason. Dr Fruchtenbaum’s argument is that “Sabbath-keepers” are not consistent in their interpretation that olam means perpetual or forever. When olam pertains to certain ceremonial facets of the Mosaic Law, Fruchtenbaum claims that “Sabbath-keepers” don’t take their own interpretation of olam seriously since they agree that these facets are not ongoing but have ended. On the other hand, when it comes to the Sabbath, Fruchtenbaum claims that these same “Sabbath-Keepers” assert that olam really means forever. However, in building up this argument, Dr. Fruchtenbaum employs a logical fallacy; for he makes a hasty generalization. To argue that “everyone agrees [certain facets of the Mosaic Law] ended with the First Coming of the Messiah” is to make an unwarranted generalization since it is impossible to substantiate such a claim. Likewise, to assert that “Sabbath-keepers claim [these same facets were] brought to an end by the Messiah” without citing any particular Sabbath-keeper, could be seen as erecting a straw-man. It is obvious that there are Sabbath-keepers that do not believe that the facets in question were brought to an end by the Messiah (e.g. the author). These same Sabbath-keepers would also say that the “main foundation for arguing” the Sabbath’s perpetuity are the many verses in the Scriptures that assure us that the Sabbath should be kept now (Isaiah 56:4, Matthew 24:20), and will be kept not only during the Millennial reign of Christ (Ezekiel 46:1) but also throughout the eternity of the new heaven and earth (Isaiah 66:22-23). There is not even one verse in the bible that informs us that the Sabbath has or will end. The terms used of the Sabbath: forever, perpetual, everlasting and throughout your generations also assure us that the Sabbath is still mandatory because of their clear meaning and because the Sabbath ordinance’s perpetuity is not (as are the other statutes) tethered to conditional stipulations such as the existence of a temple. The Sabbath is an integral part of the moral laws that God has given to man. As a reflection of the Eternal God’s standard, it will thus continue eternally.